It seems appropriate that Stornoway’s proper introduction to the world was a single called “Zorbing”—a reference to an obscure, recreational sport in which people roll down hillsides inside giant, transparent orbs. In essence, this is what the British folk-pop band’s 2010 debut album Beachcomber’s Windowsill felt like—an adventurous, distinctly free-range, and yet unavoidably lonesome and personal affair. From inside the bubble came the reverberating and soul-puncturing purity of Brian Briggs’ voice, hovering over each nostalgia-wrapped track like those larks he’d studied as an Oxford University ornithology student. 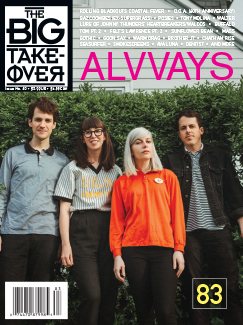 Soon enough, the esteemed UK label 4AD took notice, and Stornoway—the English band with an Irish singer and a Scottish town’s name—were on their way. Zorb forward three years, and the lads have returned for their much anticipated sophomore effort, Tales from Terra Firma. Both lyrically and musically, the album sees the band pushing forward into more complex territory, with keyboardist Jon Ouin's arrangements expanding in their scope right along with Briggs’ lyrical themes—which leave behind some of the cuddly romanticism of the “Zorbing” era to ask some heavier questions. The rhythm section of brothers Oli and Rob Steadman (bass and drums, respectively) are helping to change the pace, as well, with greater experimentation in instrumentation and time signatures. 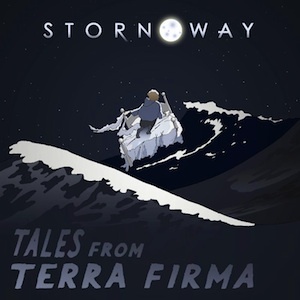 To get a better sense of the “new” Stornoway, including a track-by-track breakdown of Tales From Terra Firma, The Big Takeover caught up with Jon Ouin shortly before the U.S. release of the album on March 12. ANDREW CLAYMAN: Since the new album comes out in about a week, I figured I’d start out by assessing your current mental state, so to speak. Is everyone in the band just excited to get your work out there, or is there some apprehension like sending a kid off to university? JON OUIN: My mental state… well, it’s mostly paranoia, rage, terror. [laughs] No, we’re excited. It’s been quite a while, so we’re really happy to finally be releasing the album. It’s been ready for a while now, so it’s good to finally send it off. AC: You had quite a bit of build up to the release of the first album, as well. What’s been different this time around? JO: Well I suppose the time that’s elapsed between writing the songs and releasing the album has felt much more compressed, comparatively. Because, the first time around, it probably seemed to most people that things just suddenly happened for us overnight. But actually, we started playing around 2005 or 2006 and didn’t really get anywhere until 2010. I suppose that’s the same story with every band, though, isn’t it? Either way, there was quite a lot of time where we were really struggling to get anyone to listen to anything. So that’s probably the main difference with this album. Those early hurdles were already behind us. AC: Musically, Tales from Terra Firma isn’t a wild leap from Beachcombers Windowsill, but having listened to that first album many times, I can definitely say that the new one has a very different energy to it. The lyrical themes, in particular, have expanded a bit beyond the sort of romantic focuses of Beachcombers. Was there much discussion beforehand among the band about new avenues you wanted to explore on the second record, or did it just emerge more organically as you fleshed these songs out? JO: It wasn’t premeditated in so much as we didn’t say ‘this is the direction we want the whole album to go down.’ It was more natural in that we approached these songs and sort of tried to explore what the original thread was and take it to its conclusion—whatever that might be. There was nothing gratuitously added or anything like that. Sometimes it’s difficult to draw a distinction in a way, but I think we just approached these songs as they came. I suppose Brian [Briggs]—who writes the majority of the songs-- he may have had a larger idea of where he was going with it all. But the rest of us certainly didn’t [laughs]. That’s probably the best way of describing it. AC: How would you describe the usual process of how a Stornoway song comes to be? Does Brian generally write a melody and a lyric and bring it to you to arrange and color in, or is it more of a democratic process from the start? JO: What we normally do is he’ll have a rough demo in a very skeletal form, and we’ll either work on it together as a band or sometimes there’s a bit of pre-arranging that he might do with me or whoever. But yeah, it depends on the song. Some of them we try to leave relatively unadorned, because it may suit that particular track. AC: Do the occasional battles break out over the direction of a song, or is it a relatively peaceful process? JO: Ha, yeah, I would say it’s quite peaceful. I’ve heard of fractious relationships other people have in bands, but I think maybe we’re just more passive aggressive or something-- and English [laughs]. So it’s all good. AC: No Stornoway fist fights? AC: In terms of the live show, considering all the layering and bells and whistles on the recorded versions of these new songs, how much re-imagining is needed to transfer them to the stage? Do you see the live set as a totally separate animal from the album? JO: Well, we just did the first leg of our UK tour, and it’s quite interesting, because we did do a lot of stripping back in the arrangements. And I think it’s quite good, because I think I personally have a real fixation with what we did on the recording, and it ends up quite liberating to figure out how to sort of make these songs fat free—to do the diet versions, you know? It just involves approaching it from more of a bare essentials perspective and getting to the nub of the song in a way. So I suppose I do view the live show as a totally separate thing. You’re often making slight adjustments and reworking things a little bit every day—not to the point of being unrecognizable. But as an example, there are just certain sounds we can’t recreate without having a whole group of clarinetists or a whole load of string players. And sadly, we can’t take them all on tour. So, yeah. But I am actually really enjoying figuring out all those logistics. AC: Getting back to the album itself, one thing that Terra Firma has in common with Beachcombers, to me, is that it really works as a cohesive whole, instead of a scattershot collection of singles. How important is that idea of the full album as a work of art to you guys, and do you worry that people seem to be losing patience for buying or listening to whole albums anymore these days? JO: Hmm, yeah. I do worry about that. You can only be kind of impotent in that worry, though, of course. There’s nothing much you can do. But I do think I personally—and I think the others probably agree—I really value the idea of a thread that runs through a bunch of songs, even it’s just a type of sound that’s consistent instead of a lyrical element. I mean, you can’t legislate the way people listen to music. We can’t force them to listen to the whole album, unfortunately [laughs]. At best, we would certainly urge people to listen to what we’ve done in the context that we intended. But you know, there might still be people who just pick their favorites or say, ‘what the hell is that song doing on the album?’ It’s just something you can’t control and probably wouldn’t want to anyway. 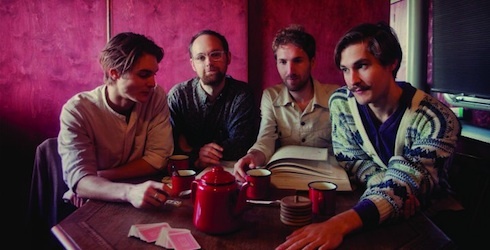 AC: After the first album, Stornoway eventually seemed to get grouped into the so-called neo-folk movement quite a bit, which I don’t necessarily see myself. But overall, do you just embrace those comparisons—since being associated with something popular isn’t such a bad thing? Or are those sorts of misconceptions more annoying than anything? JO: Well, I’m with you in not really understanding the association myself. I suppose when I first heard Brian sing, it did remind me of certain folk artists. But I think now, aside from having an acoustic guitar, I’ve never really understood what that was all about. I don’t know. I think of what we do as more like soul music in a way-- not in the Marvin Gaye kind of sense, but I suppose more in the lyrics and the honesty there. Something that runs through it. But the folk talk doesn’t really bother me at all, apart from the fact that the phrase “new folk” is pretty odd. I mean, there are plenty of bands where you might gain some advantage by being associated with them, but that’s certainly not our prerogative. And I just don’t really see it myself. AC: For this last bit—to sort of provide a sneak peek of the new album for American readers—I thought I would just go track by track and let you share any random thought or insight that springs to mind. Could be about the production, the instrumentation, a memory of performing it. Anything you wish. Sound good? JO: Sure, let’s do it. JO: There’s some obvious lyrical references to marriage there, so it’s quite a positive affirmation song really, in a way. I suppose it’s anecdotal, and it’s set in Wales, in Pembrokeshire. It’s kind of a coastal song [laughs], and it’s pretty autobiographical I would say. JO: Well that one lyrically is a bit more of a mystery to me. I did kind of have a hand in the musical side of it. It’s based on an old demo I had started that had a bunch of funny loops and strange DIY sounds. And we kind of redid it, and recorded it in a church, as well. So it’s got a kind of a different sort of expansive ambience to it. Right, well Brian has been playing that solo for quite a while. So it’s probably one of the older ones we have in terms of performance, and we’ve been gradually adding pieces to it. But yeah, it’s been a long-standing one. I suppose it’s broadly about perspective, not to be as vague as that. But it’s about trying to reassure somebody. That’s the central message. JO: That one features some use of the Doppler effect, if you know what I mean by that. You know when a car goes by, or an airplane—the change in the pitch. JO: It’s set in Turkey—well, not specifically Turkey—but it’s got a European flavor to it. And it features a Bavarian spoon solo, and an instrument called the Qanun, which is Turkish and similar to a zither. JO: Well I think the message possibly applies to all the members of the band. We’re all procrastinators. That’s why it’s taken us so long to finish the album. It also features four clarinet players, one of whom is Oli [Steadman], who plays bass normally, but he took up the clarinet for that one. JO: That again was recorded in a church and it’s one we’ve been performing a cappella recently—no guitar, just the four of us doing four-part harmony. JO: That’s a solo song of Brian’s which is the oldest on the album, and was in fact recorded before the Beachcombers Windowsill album. We just couldn’t find a way to make it fit on that record. It seemed a bit more contemplative or meditative or something. With this album, though, it just seemed to bring things to a suitable end while also revealing a sort of beginning in some respects. AC: Great! Final question, then. With both the release of Tales from Terra Firma and this upcoming American tour, what are you hoping to accomplish, or what do you hope people take away from the experience? JO: I hope that people can see a kind of more fully fledged version of what we were, and that we can just build on what we started. I mean, we’ve been to the U.S. a couple times and we’ve had a good response so far. So we’re very excited to be coming back. A live performance of "The End of the Movie" from Stornoway's first LP, Beachcomber's Windowsill.